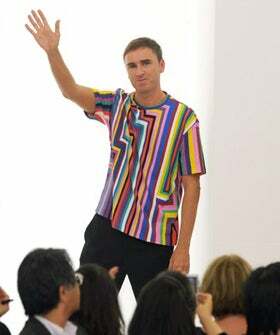 It was speculated yesterday that Raf Simons might be on the fast track to Dior as Jil Sander returned to the eponymous line she founded as creative director, but now it looks like that won't be the case. WWD reports that though Simons had been in talks with Dior, an agreement was never reached, and chances that Simons will be Galliano's successor is slim. Fashionista also spoke with Anna Dello Russo, who mentioned that the modernist Raf may instead focus on his own menswear and womenswear lines, and exercise some of the creative wiles that may have been limited while he was forced to design within the purist, Jil Sander constraints (of which he did a glorious job).